Following widespread allegations of sexual misconduct at both major English universities in Montreal, students at McGill and Concordia are taking steps to try to change things — literally. A few hundred walked out of their classrooms today in an effort to force their administrations to acknowledge the extent of the problem, and take wider steps to change things. The walkout started at 2 p.m. and was organized by the Concordia Student Union and Students' Society of McGill University (SSMU). Students from both universities gathered at Community Square, outside McGill's administration building on the downtown campus. Protesters brandished signs that read, "Who are you protecting?" and "Do you care about survivors?" in an effort to catch the university's attention. "We deserve to be safe in our classes, we deserve to be safe [during] office hours to talk to profs," said Maeve Botham, a McGill political science student who didn't go to her class today so that she could take part in the walkout. The protest comes following an open letter from student leaders at McGill, which alleges the school has not done enough to address complaints against at least five professors in the Faculty of Arts over allegations of "abusive" behaviour and sexual violence. For Connor Spencer, vice-president of external affairs for the Students' Society of McGill University (SSMU), it was important to organize alongside Concordia to show the scope of the issue. "I think McGill is trying to work within its own bubble," Spencer told CBC Daybreak's Mike Finnerty Wednesday morning. "That's why it's important we bring Concordia, and what happened on their campus, to our campus." Though the students are mobilizing for the same cause, their requests differ. 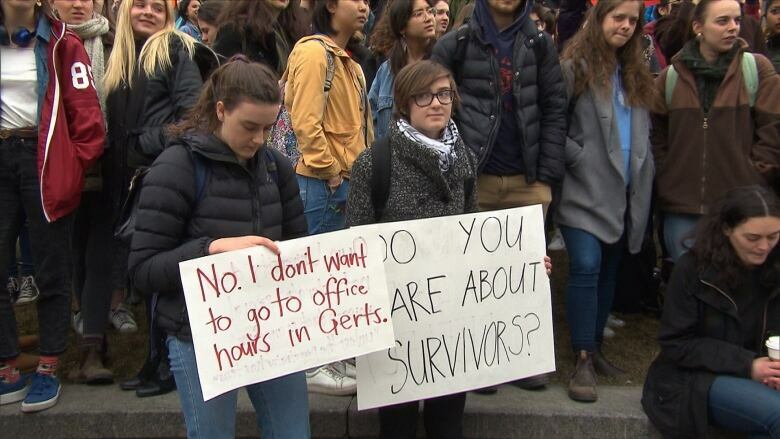 McGill student organizers are calling for an external investigation into the university's handling of complaints made against professors, and a stand-alone sexual violence policy. On the Concordia side, students want to include student voices in the reformative investigation that is already underway. They also want recommendations from the Our Turn Report, a student-led action plan to end sexual violence spearheaded by SSMU, to be incorporated into Concordia University's sexual violence policy. "We all demand an acknowledgment of the extent of the problem. And we demand change," reads the Facebook event description. Both universities say they have been taking steps to acknowledge the allegations. In response to the SSMU's open letter, McGill's administration said in a statement that the university doesn't tolerate sexual misconduct in any form. "It is not the case that McGill's leadership ignores reports of sexual misconduct by members of our community," the statement reads. It adds that many resources are available to students, and that a committee to implement a policy against sexual violence, with student-faculty representation, has a mandate to report to the provost by fall 2018. Concordia responded to the walk-out by saying its task force on sexual misconduct and sexual violence is consulting with the Concordia community and that the university encourages students to participate "through any avenues open to them," read a statement sent to CBC. "Their input is vital to the work we are doing."